I bought my suit a couple of years ago but it still looks fantastic. I got the brown version and have worn it a lot. 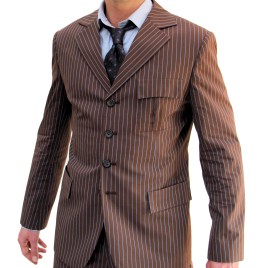 I've even worn it to meet David Tennant, who is always glad to see a 10th Doctor in the crowd. Got the ties to go with it to get the details right and it looks so good. I've even received compliments on my suit from people who don't realize it is cosplay. It is a genuine suit.